Is the Shops and Lofts at 47 the Answer in Bronzeville? 47th Street: Is the Shops and Lofts at 47 the Answer in Bronzeville? 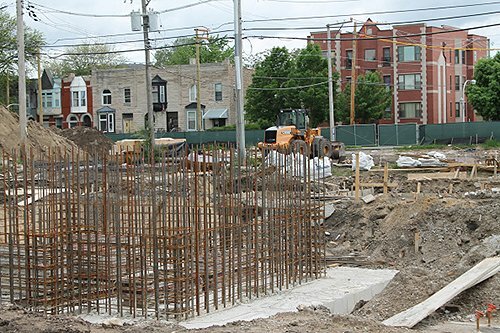 After seven years of changes and setbacks, The Shops and Lofts at 47 -- located at the corner of 47th Street and Cottage Grove in the Bronzeville neighborhood -- has broken ground. The project should be finished sometime in 2014, with a 41,000 square-foot Wal-Mart Neighborhood Market, 14,000 square-feet of local retail space and 96 rental apartments. An effort to improve and transform the Bronzeville neighborhood, the rental apartments will be mixed-use with 28 units receiving both Chicago Housing Authority and Low Income Housing Tax Credit subsidies, 44 units receiving low-income tax credit subsidies, and 24 units will be market price. Lucas is also the director of the Bronzeville Visitor Information Center. He said he’s thankful that something is happening to improve the Bronzeville neighborhood’s housing and retail options, but does not think this project is empowering lower and middle class. “For the city of Chicago to put an anchor project on Cottage Grove that doesn’t tell us how it fits more broadly with the other things that are happening west of there, it is to me like putting a Trojan horse into a community and taking that community over,” Lucas said. Dr. William Sampson, a DePaul University professor who specializes in educational policy, urban studies/poverty, housing and race, said he thinks the project will not succeed. 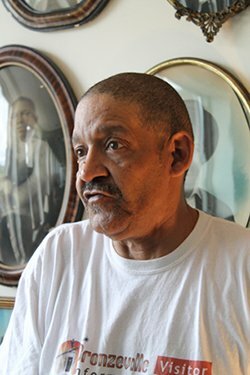 Bronzeville has “changed vastly,” Sampson said, because of a population increase in the 1960s and early 1970s. He said that with more people in the community, they had to divvy the brownstones built for one family and accommodate a couple families, deteriorating the housing market rapidly. The biggest issue for Sampson is mixed-use housing. The Shops and Lofts at 47 would have units for people with a lower income but also units for people that can afford market price housing. Dr. Adrienne Holloway, a DePaul University assistant professor in the School of Public Service, agreed with Sampson that filling those units will not be easy. “I think it’s going to be a challenge to fill those units with anything other than CHA tenants,” said Holloway, who teaches public policy and began her career in community development working in South Bronx in New York City; 5th ward in Houston; and East L.A with a focus on building affordable housing in poor neighborhoods, assisting non-profit organizations with housing development, and resident services. Sampson said he believes that Wal-Mart, the main retail attraction for The Shops and Lofts at 47, will not help the Bronzeville community flourish. Norman Montgomery, a former Bronzeville resident and the Chief Information Officer of Board of Directors at the Black Metropolis Convention & Tourism Council, thinks the Wal-Mart is a problem for local businesses in the area. Mayor Emanuel’s new program, Chicago Neighborhoods Now, is designed to improve seven communities in Chicago—including Bronzeville. He has said the development is the beginning of working toward a better community. "Neighborhoods are the fabric of Chicago,” Mayor Emanuel said in a press release from the mayor’s press office. "Communities need anchors, and these ‘Shops and Lofts’ will create an important foundation for more jobs, more housing, and more goods and services along 47th Street and beyond." Sampson argued that these jobs are not fulfilling. "The people hired to work at the retail store are (going to) get minimum wage and non-union jobs,” Sampson said. “Now, is that better than nothing? Yeah, but not a whole lot and that’s what those kinds of places pay. And the construction job is (going to) be over in a couple of years. They’re gone, then what?" Holloway said he is worried about future employment opportunities beyond the construction project. The Shops and Lofts at 47 are expected to provide 144 temporary jobs and 100 permanent jobs. Lucas encourages the conversation about inclusion and breaking the cycle of poverty among the masses with remedial-level jobs that prevent people from turning to crime to support their family. Montgomery supports that conversation.